PROVIDENCE, R.I. [Brown University] — Last year, scientists with NASA's Dawn mission announced the detection of organic material — carbon-based compounds that are necessary components for life — exposed in patches on the surface of the dwarf planet Ceres. Now, a new analysis of the Dawn data by Brown University researchers suggests those patches may contain a much higher abundance of organics than originally thought. The original discovery of organics on Ceres was made using the Visible and Infrared (VIR) Spectrometer on the Dawn spacecraft, which went into orbit around the dwarf planet in 2015. 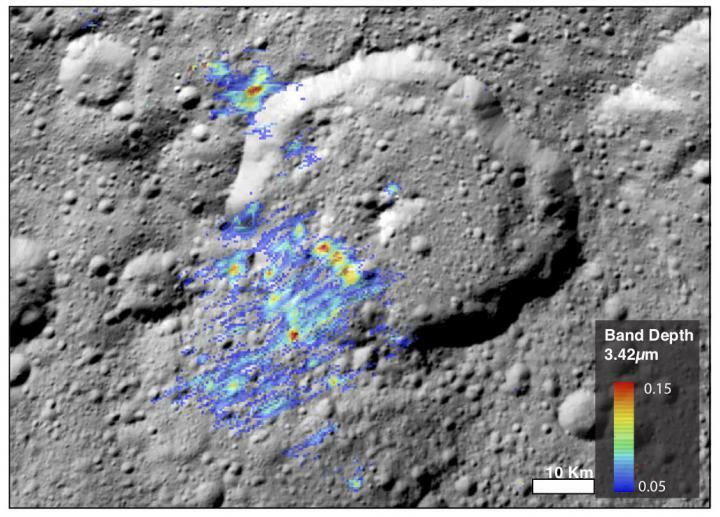 By analyzing the patterns in which sunlight interacts with the surface — looking carefully at which wavelengths are reflected and which are absorbed — scientists can get an idea of what compounds are present on Ceres. The VIR instrument picked up a signal consistent with organic molecules in the region of Ernutet Crater on Ceres' northern hemisphere. But for this new research, Kaplan and her colleagues wanted to re-examine those data using a different standard. Instead of relying on Earth rocks to interpret the data, the team turned to an extraterrestrial source: meteorites. Some meteorites — chunks of carbonaceous chondrite that have fallen to Earth after being ejected from primitive asteroids — have been shown to contain organic material that's slightly different from what's commonly found on our own planet. And Kaplan's work shows that the spectral reflectance of the extraterrestrial organics is distinct from that of terrestrial counterparts.